Impact! Miniatures is no stranger when it comes to Kickstarter campaigns. In fact, they're currently working on their 40th. In this case, it's for a trio of new fantasy football teams. There's the Ogres, the Halflings, and a female Norse team all going right now. Impact! has returned with their 40th KickStarter campaign to bring to production three full 16+ player 32mm scale fantasy football teams. 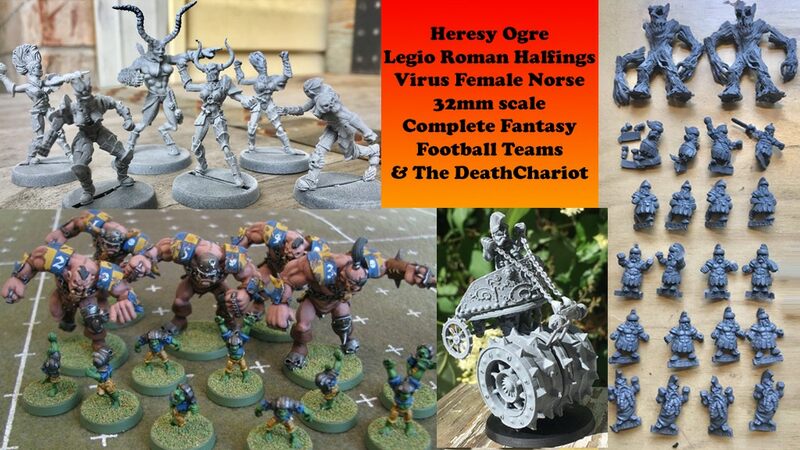 The Heresy Ogre team, the Legio Roman Halflings and a female Norse team. The project has funded and is close to unlock free dice for the backers as well as a 4th team of Ratmen. The KickStarter is also offering a special promotion to get the past 32mm fantasy football teams from Impact! or Rolljordan at only $38 a team or less if 2 or more teams are selected which is a big savings off the normal retail price for those teams. (Teams include Chaotic Dwarf, Undead, Wood Elf, Frog and High/Dark Elf). Project ends Thursday night, July 5th. The campaign's over its funding goal, but as you see above, there's not a lot of time left to get in on the action.